OK gang, here are the latest stats! We broke the 500 mark this week—actually, we’re well past it now, thanks to the 142 juvenile salmon caught on Monday and Tuesday! On August 24, Bruce Brown’s crew caught 9 salmon in Cowlitz Bay using the standard method (2 sets total). The local crew then caught 19 salmon at Cowlitz with our own deeper-water method (2 sets total). 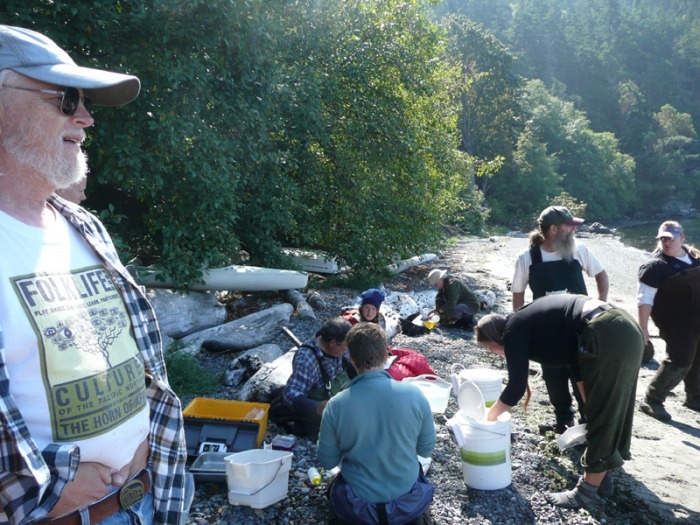 The salmon caught by Bruce’s crew were smaller on average (100mm compared with 123mm), with a smaller range (91-115mm as compared with 91-153mm). On August 25, Bruce Brown’s crew caught 23 salmon at Hughes Bay and 4 at Watmough using the standard method (3 sets total). 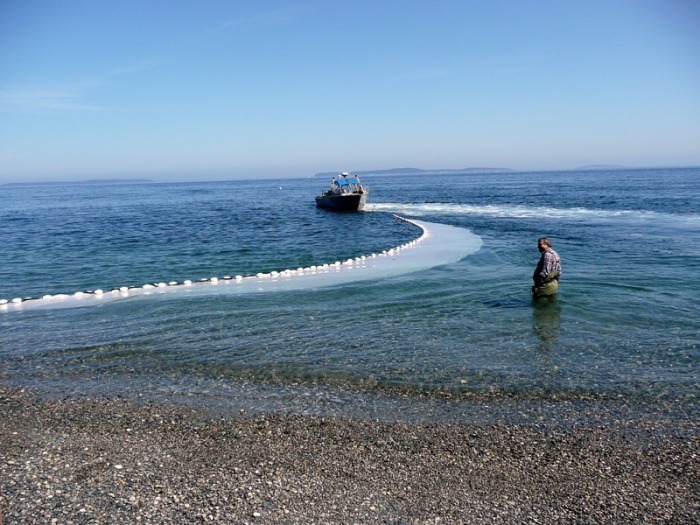 Our Lopez crew caught 87 salmon at Watmough using our deeper-water method (2 sets). Average length was about the same regardless of method (153 mm for the standard method, 151mm for the our method). Our deep method caught a wider size range of salmon, both larger and smaller, but this could simply be due to the much larger sample size. 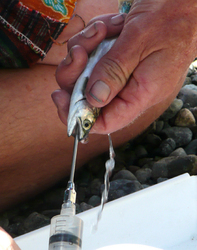 We saw several thousand sand lance at Watmough again, as well as some young herring and adult smelt. 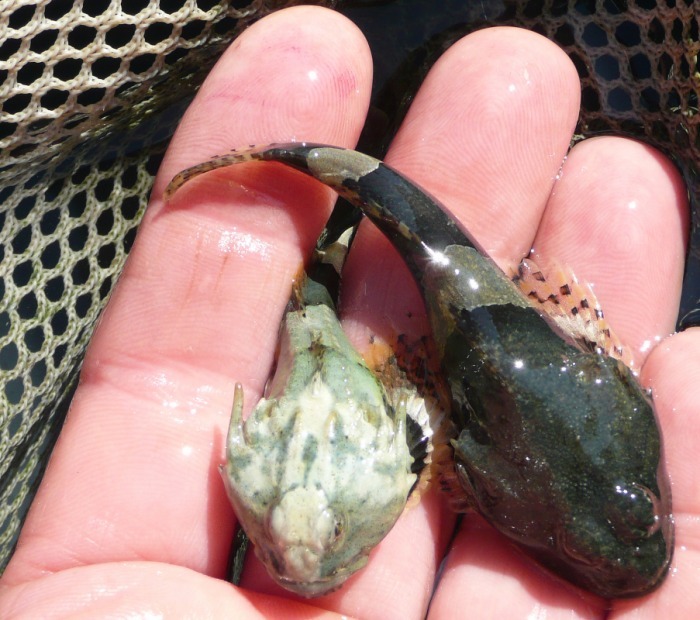 There were few “bait fish” to be seen at Cowlitz, however, and we saw more bellies full of insects and amphipods there. We also began seeing fish that we had clipped 2-4 weeks ago, an indication that salmon stick around the islands for awhile! 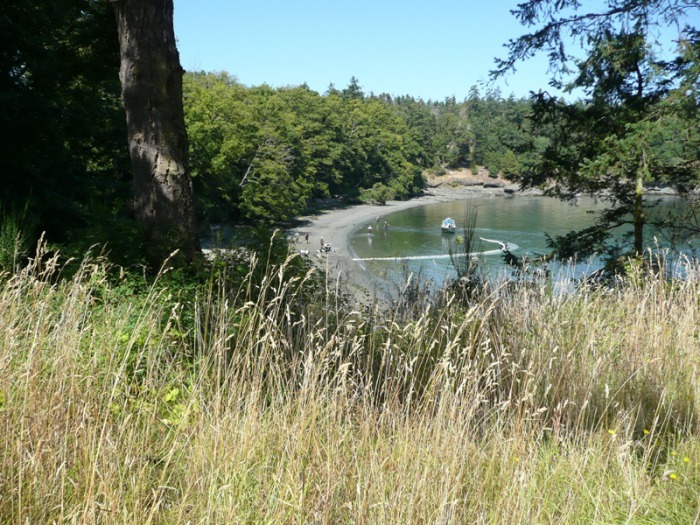 Our finding a rhinoceros auklet at Hughes Bay two weeks ago drew attention from seabird biologists, and we are being invited to participate in a recently-launched State seabird study, as well as shoreline seabird monitoring around our island. 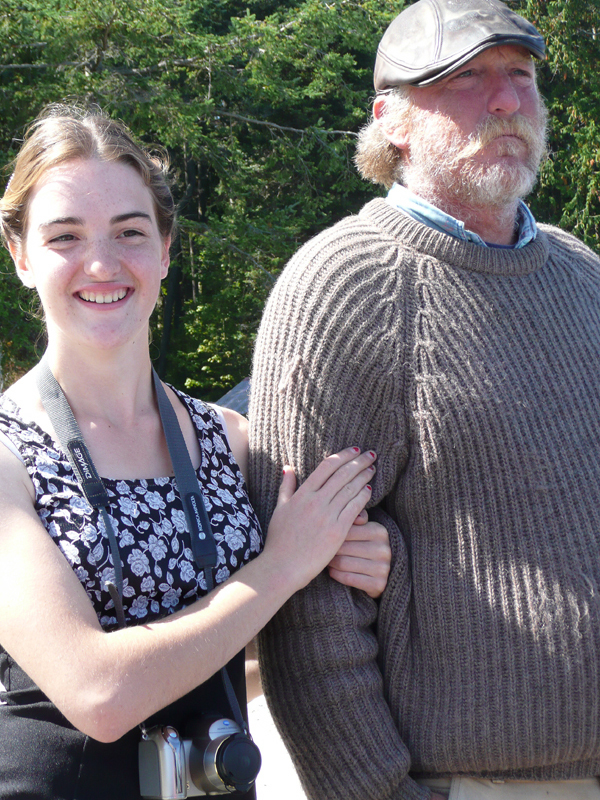 Monique Lance at WDFW is studying what seabirds eat, and she will come here in September to tell you about her research! 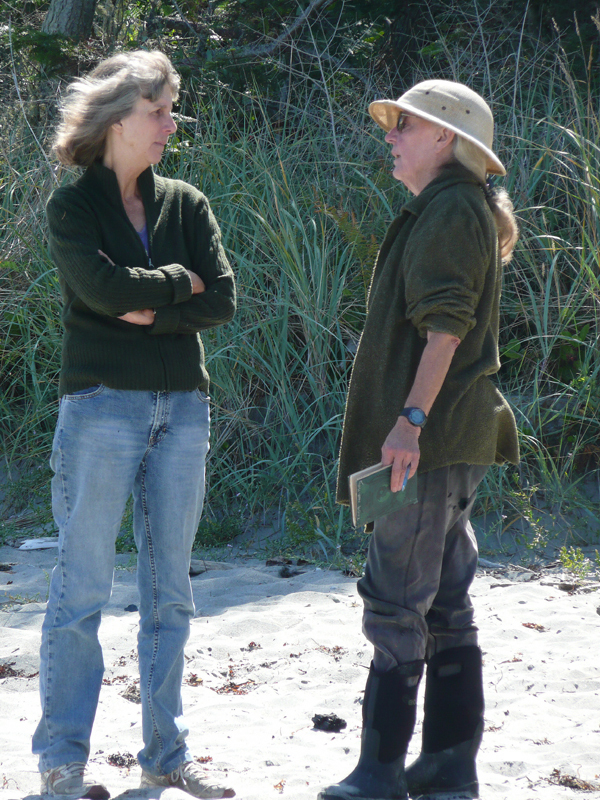 Julia Parrish from the UW would also like to train some of you to be COASST observers. This is a great opportunity for some of you to get out walking around the island even more, collecting seabirds and seabird data. Obviously there is a very strong trophic connection between salmon and seabirds: they eat some of the same things... and seabirds often eat juvenile salmon too! Remember that we're scheduled to piggyback with Bruce Brown again in just two weeks -- either September 10, as originally scheduled, or September 11. We'll start at Cowlitz Bay at 11:00 am again, fish with Bruce for 2-3 hours, then in the afternoon (about 3:30-4:00 pm) we'll fish again with our own net and deep-water method. I should know soon whether we're fishing the 10th or 11th. 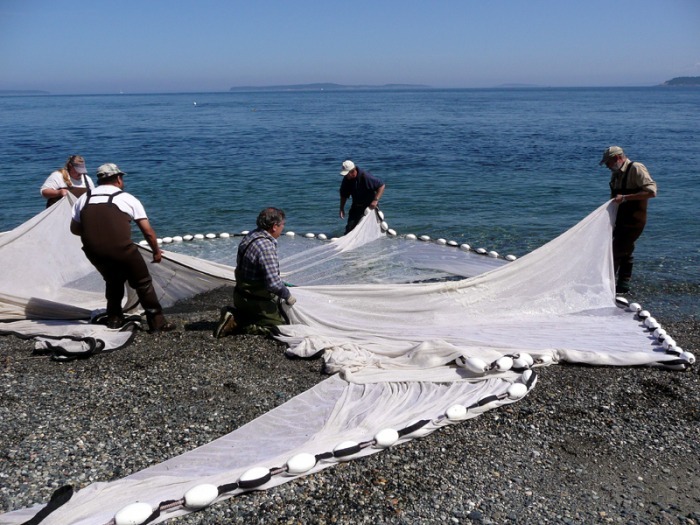 Our last seining of the season (on our own) has been scheduled for Saturday, September 26. Alas, I have now a class to teach at the Labs that weekend -- so I would like to see about fishing your island on Thursday September 24 instead. Will that work? And think about some champagne or other appropriate ways of celebrating a great research season! Aug 24 seine with Bruce Brown and his crew doing all but the last seine, and Russel Barsh, his crew, and our crew lavaging. 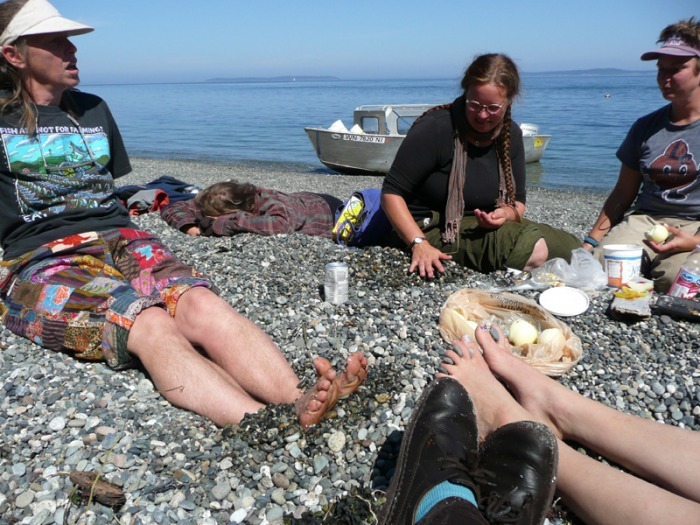 Two other August seines occurred but have not yet been uploaded. Aug 24, 2009 Cowlitz Dock 11:00, water temp 11.5/11.4º, salinity 30.8/30.4, hazy sunshine. 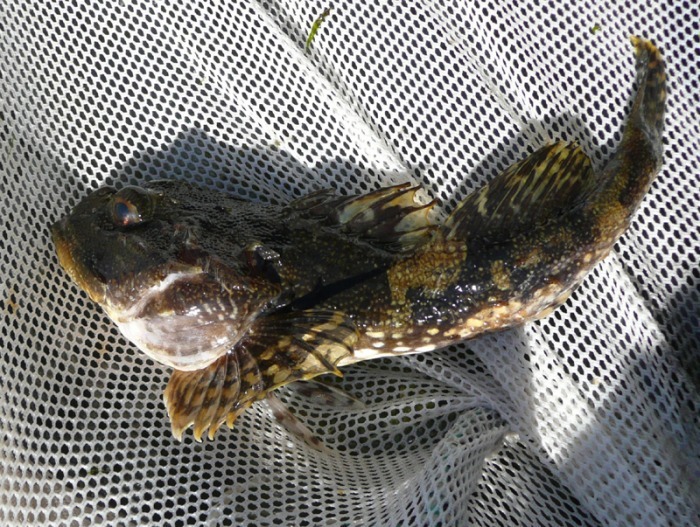 1 Great Sculpin, ........................430 mm ! 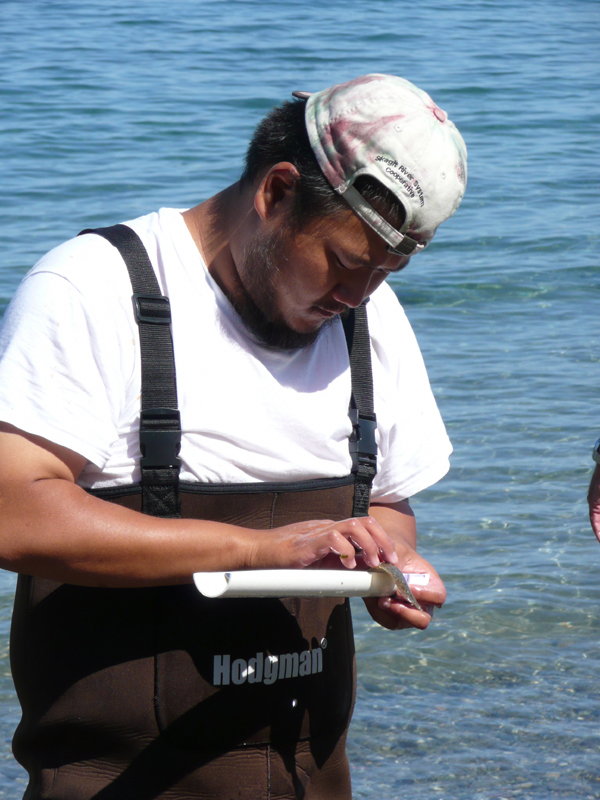 We lavaged the 6 Chinooks, finding that they had been eating terrestrial insects or zooplankton. Images below show: Lavage crew. Penpoint Gunnel (green eel-like fish). 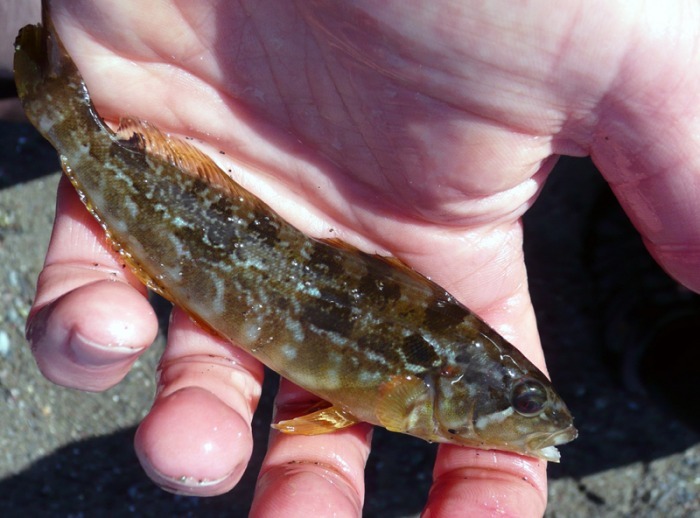 Kelp Greenling (yellowish, in hand). Sculpin (greenish, in hand). Yayoi and Jenn. 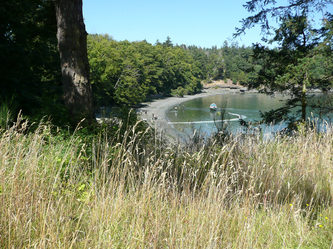 Aug 24, 2009 Severson Bay 12:05, water temp 11.7/11.8º, salinity 30.9/30.7, sunny. 2 Crescent Gunnels, ................. 60 and 63 mm. 16 Dungeness Crabs, 2 Rock Crabs. 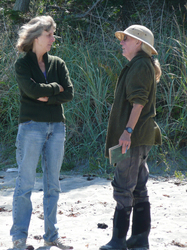 Images below show Camilla and David, Susan and Gretchen, and a guy on Bruce's crew measuring a fish. Aug 24, 2009 Zeo's Beach 12:25, water temp 12.0/11.8º, salinity 30.3/30.4, sunny. Images below show: Shallow water set. Moving fish towards a pouch in the net. Two sculpins. Lion's Mane Jelly. Lunch. 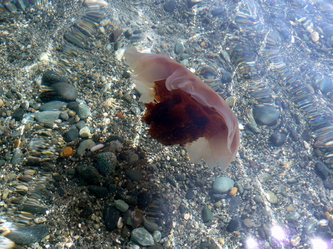 Aug 24, 2009 Mail Bay 13:50, Water temp 13.1/12.0º, salinity 30.3/30.2, sunny. Images below show Mail Bay. 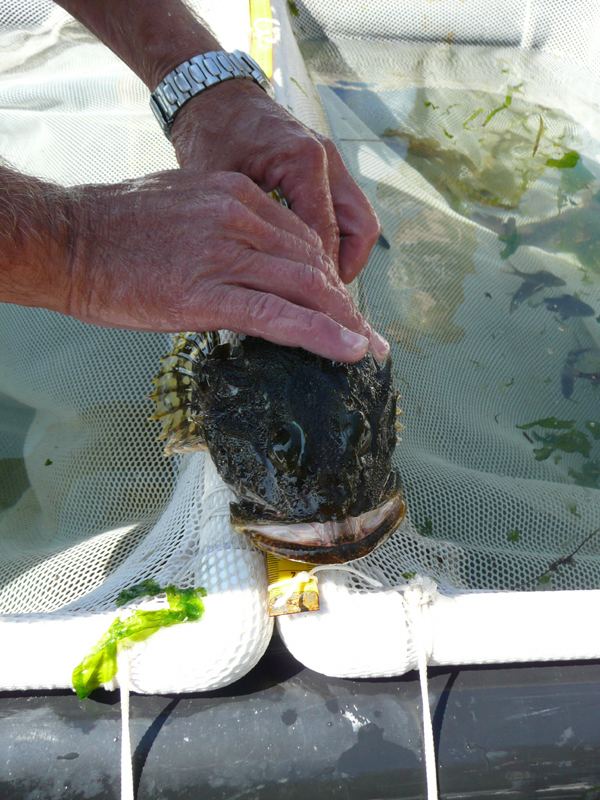 Sculpin in net. 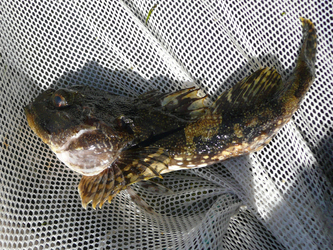 Sculpin on net. 19 Chinook Salmon ..................91 - 153 mm – caught in second tow begun just inshore from dock hammerhead depth. 22 Tubesnout .......................... 98 - 179 mm. 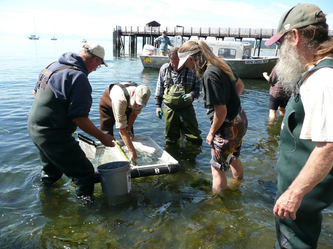 All chinook were lavaged and fin samples were taken. In general, the smaller salmon had eaten terrestrial insects and zooplankton, and the larger ones had eaten little fish. We also lavaged the greenlings, which seem to have eaten teeny weeny shrimp, not the same as what the salmon had eaten. 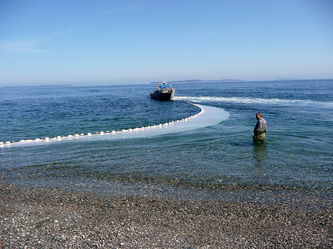 Images below show: Gathering around salmon holding net. Lavage. 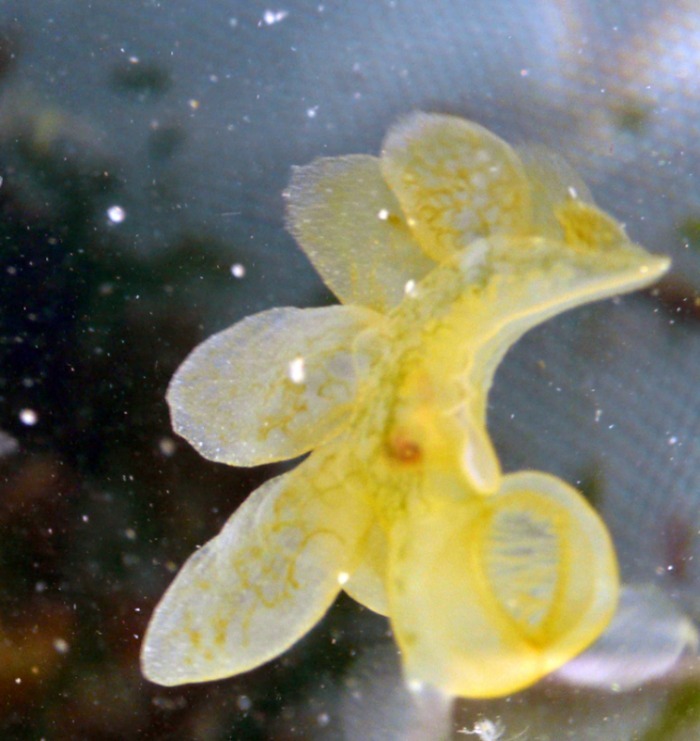 Melibe leonina (Lion Nudibranch) This one was about 2.5 cm across; they can grow to 9 cm. 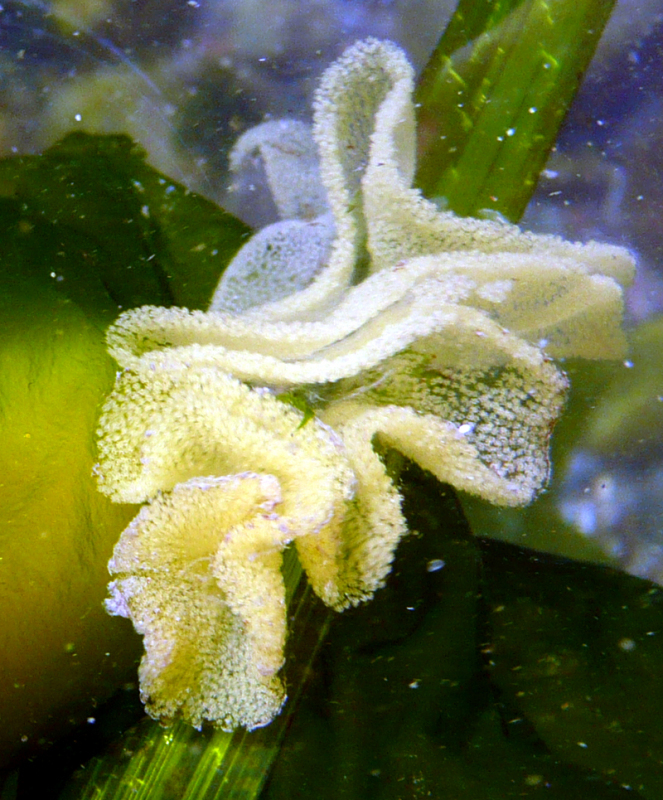 Nudibranch eggs on eelgrass. Copper rockfish.